We provide a variety of cleanroom options and lab solutions for a fully customized CLEAN3 Turn-key System. Further, all of our lab solutions are composed of stainless steel and may be custom designed to fit any project application. Our free-standing gowning racks with hanger rails are designed for efficient storage of garments in the cleanroom. 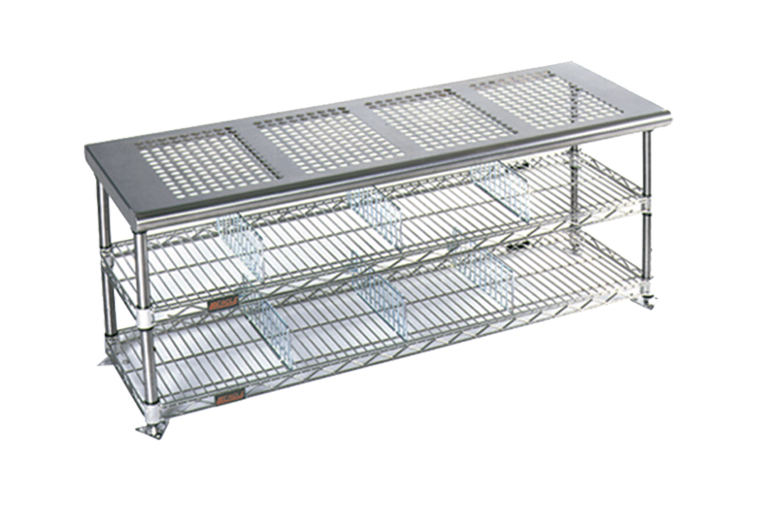 Further, each rack is available with either stainless steel or electropolished finish. Additionally, the stainless steel construction offers a non-contaminating surface that eliminates particle shedding. In addition, the electropolished models feature electrochemically passivated surfaces, for the most demanding requirements. 24˝ width, 75˝ height, and available in 48˝ to 84˝ lengths. Moreover, hanger slots are standard 3˝ centers. Other center configurations are available upon request. 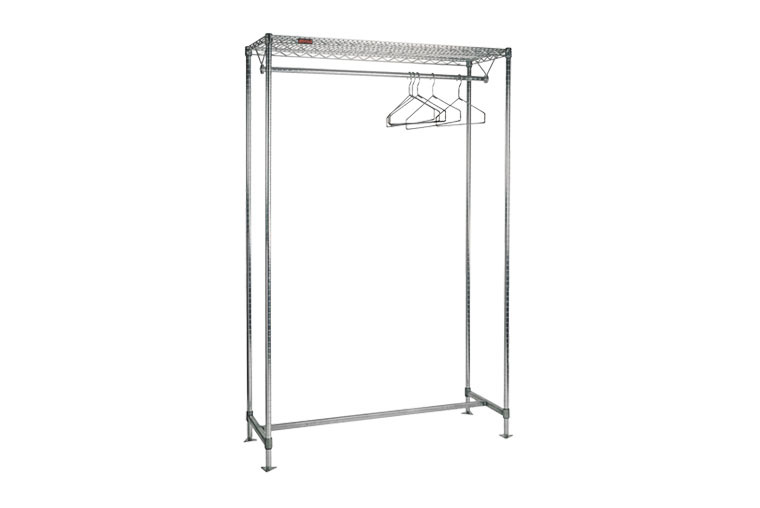 Our gowning racks with wire shelving feature the patented QuadTruss® design, with special gown storage options. Additionally, they offer a more economical rack option in less demanding environments. 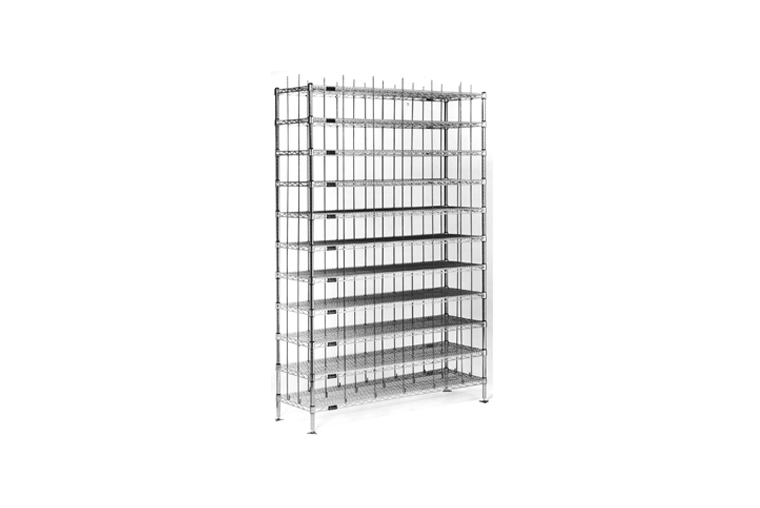 Likewise, each rack is available in either chrome-plated steel, electropolished or stainless steel. Dimensions include 14˝ and 24˝ widths, 48˝ to 72˝ lengths and 86˝ height. 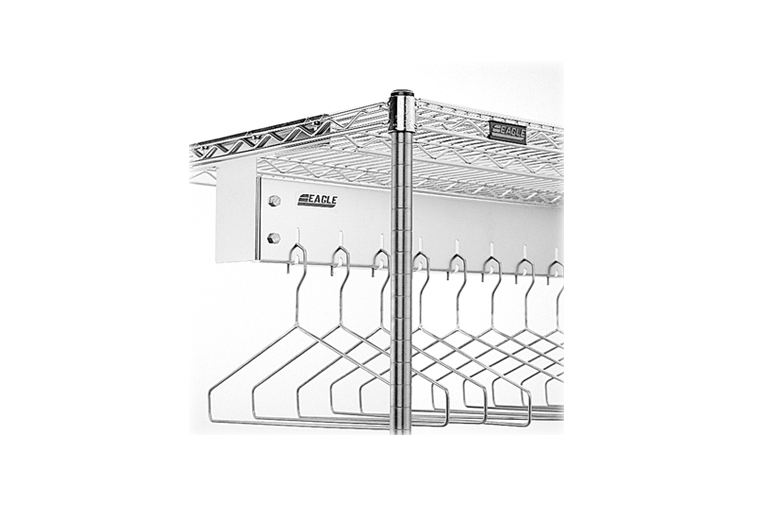 Racks with Hanger Slots are available in lengths of 48˝ [17 hangers], 60˝ [22 hangers], or 72˝ [27 hangers] and width of 24˝. Wall mounted, and includes open wire top shelf for laminar flow. Available in electropolished stainless steel or chrome finish. Hangers are optional. Racks with Hanger Tubes are similar to the freestanding model, and features a 1˝ diameter tubular bar which mounts easily to underside of wire shelf and comes in width of 18˝ and lengths of 48˝, 60˝, and 72˝. Wire design facilitates laminar flow. Available in electropolished or chrome finish. Racks with Hooks offers a compact design is 14˝ in width and comes in lengths of 48˝ [30 hooks], 60˝ [38 hooks] or 72 [46 hooks]. Available in electropolished or chrome finish. 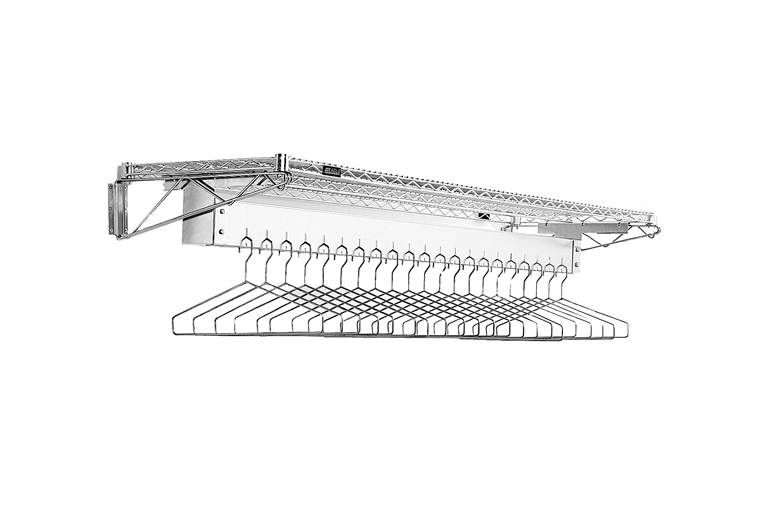 Open Loop Hangers are used for all gowning rack models that employ hangers. Available in chrome, brush finish, or electropolished stainless steel. Two-Piece Hangers are used with non-removable hanger models. Moreover, the top component is affixed to the gowning rack, while the bottom component is removable for convenient mounting of the garment. Available in chrome, brush finish, or electropolished stainless steel. 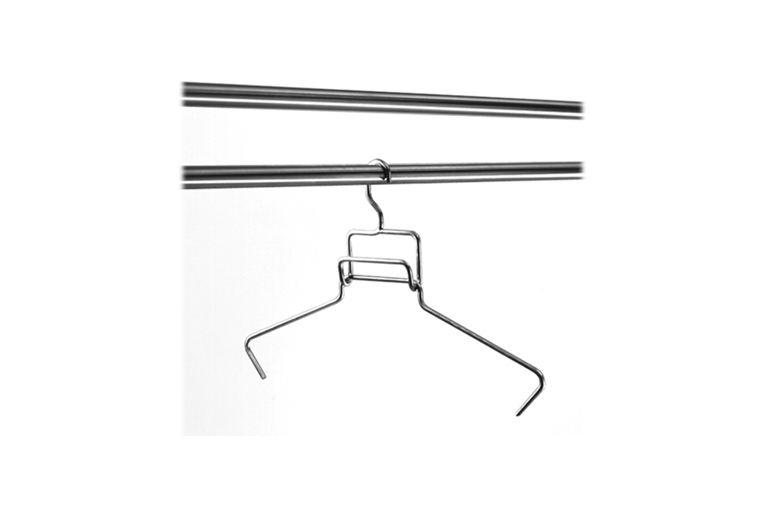 Closed Loop Hangers are used with tubular gowning racks. Hangers are not removable from rack. Available in chrome, brush finish, or electropolished stainless steel. Slanted Hanger Bar Kits are used to retrofit existing shelving into freestanding or wall-mounted gowning racks. Hanger slots on 21⁄2˝ centers. 24˝ shelf width required. Available in chrome, brush finish, or electropolished stainless steel. Tubular Hanger Bar Kits employ both closed loop hangers and open loop hangers. Available in stainless steel and chrome. Width 18˝, and length ranges from 48˝ to 72˝. Solid Gowning Benches include flanged stainless steel foot plates for convenient attachment to the floor. Available in brushed 304 stainless steelor electropolished finish.Widths of 9”and 12”, lengths up to 84”, and height of 17”. EL Series Heavy Duty Solid Gowning Benches feature hat channel on underside of seat. Stainless steel foot. 14 gauge type 304 stainless steel. 16” front-to-rear, lengths up to 84” and 17” height. Available with welded or adjustable H-frame, or with adjustable 4-sided frame. Gowning Benches with Undershelf Storage are available with either a perforated or solid seat. Likewise, wire undershelves offer optional bootie storage. These units come complete with designated seat, legs, foot plates, and one wire undershelf (additional wire shelves and dividers are optional). Available in electropolished or stainless steel finish. Seating area is 18” wide, and wire undershelf is 14”wide. Length up to 72” and height of 19”. Wire Gowning Benches are economical and feature wire shelving components with 62% laminar flow. Further, these benches are ideal for less demanding environments or for use during construction. All units feature four 18” legs with foot plates, one 3-sided channel frame, and one wire shelf. 14” width, 18” height, and available in lengths up to 72”. 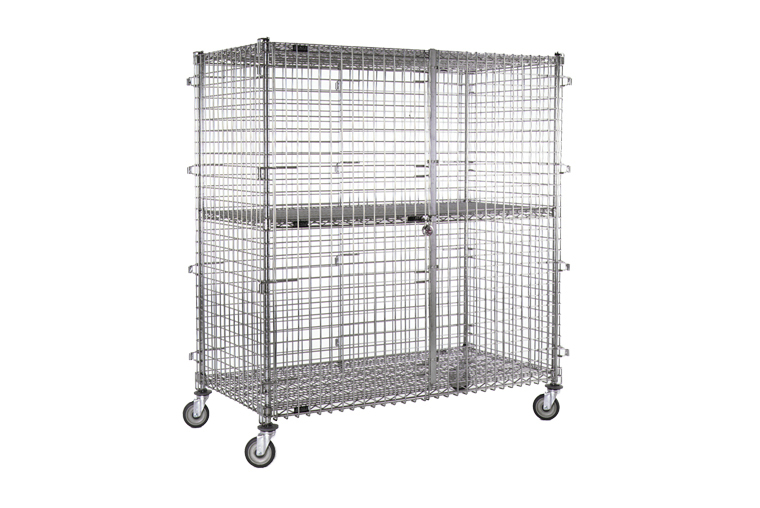 Carts and Wire Shelving Units are constructed of open wire, promoting higher visibility and permitting greater air circulation. In addition, the combination of these features help reduce dust and contamination build-up. The QuadTrusse design makes shelves up to 25% stronger. Likewise, posts are numbered on vertical 1” increments to ensure fast, level assembly of shelves and maximum flexibility for unit/cart configuration. Numerous sizes and combinations are available. Accessories available include dividers, ledges, label holders, enclosure panels, and more. Utility Carts are ideal for light to medium-duty transport in virtually any environment. Three stainless steel shelves welded to angle legs and caster channel frame. Four 4” diameter swivel plate casters. 1” diameter handle on one end. Available with standard 1” high upturn on ends and rear of top and center shelves, or 1” high upturn on all sides of all shelves. 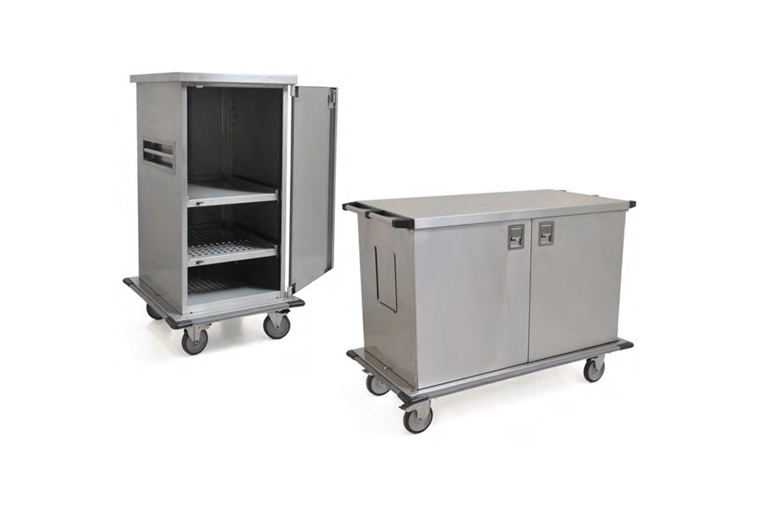 Change Part Storage Carts feature hemmed safety edges (on all openings), double-panel reinforced doors with integral drains, and hinges (fitted with precision self-lubricating bushing and pins). Interlocking cabinet design ensures rigidity and quiet operation. Available in single, double, and extended double-width units. Wire Shelving Units are composed of open wire construction promoting higher visibility and greater air circulation, which reduces dust and contamination build-up. Further, the QuadTrusse design makes shelves up to 25% stronger. Likewise, posts are numbered on vertical 1” increments to ensure fast, level assembly of shelves and maximum flexibility for unit/cart configuration. In addition, numerous sizes and combinations are available. Accessories available include dividers, ledges, label holders, enclosure panels, and more. Adjustable Posts Wire Wall Mount Shelf Systems provide wall storage and facilitates laminar flow. Use with standard wire shelves (sold separately). Further, each shelf system is designed to hold up to four tiers. The shelf widths range from 14” to 24” and the post height range from 14” to 63”. Available in chrome and stainless steel. AdjusTable Overshelf Systems allow you to create work surfaces enhanced with two wire or cantilevered overshelves. Additionally, each work system comes with the two overshelves (two 29” posts come with wire overshelves only), two 33” front posts, two 63” rear posts, and your choice of the following table bases: two C-frames; two H-frames; one C-frame and one wire undershelf; or one H-frame and one wire undershelf. The available sizes are 24” to 36” width and 36” to 60” length. Moreover, work surfaces are available with solid or perforated tops, brushed or electropolished. Overshelves are offered in stainless steel or chrome finish. Optional keyboard, utility drawers, and casters are available. 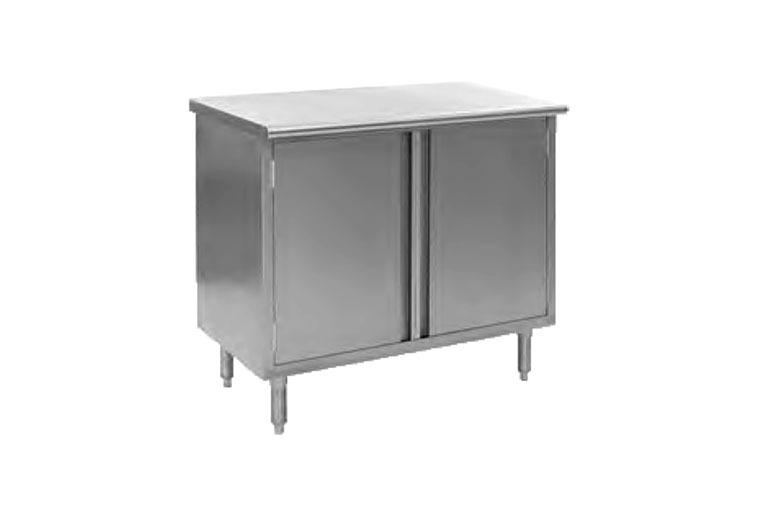 Wall Cabinets are constructed of heavy gauge stainless steel. Further, the recessed back features a full length concealed mounting plate for easy installation. Standard with fixed center shelf. 28” overall height. Lengths from 36” to 96” available. Additionally, options for open front, hinged doors, or sliding doors are available upon request. 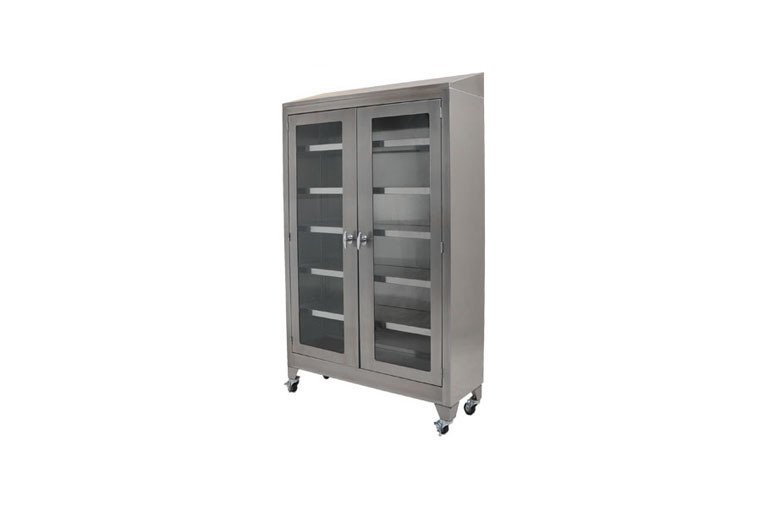 Vertical Storage Cabinets feature 18-gauge stainless steel cabinet body. Available in 36” and 48” lengths. Flat top or slanted top models available. Lastly, optional 5” plate casters with brake are also available. 304 stainless steel comprises all cleanroom tables; available with solid or perforated tops in a brushed or electropolished finish. Further, all perforated tops have 3⁄4˝ perforations on 1˝ centers, allowing for 40% laminar flow. Likewise, each table is available in standard widths of 24˝, 30˝, and 36˝ and lengths from 36˝ to 96˝. Moreover, custom sizes are available upon request. Standard table bases include C-frame or H-frame in brushed or electropolished finish. Lastly, undershelves are also available on request. Mobile Table with Flex-Master®and Drawers feature a flexible system for both new and existing operations. Moreover, our overshelf systems utilize standard components and feature unsurpassed style, strength, performance, and flexibility. Further, our tables are completely customizable to suit any project application. Likewise, unlimited combinations of shelves and utility racks to meet any need – Imagine the possibilities! Mobile Computer Workstations are open wire workstation allows for laminar flow, reduces moisture and dust build-up. Further, each station features a standard keyboard drawer and optional mouse shelf. Available in chrome or stainless steel finish. 5” swivel casters with choice of resilient or polyurethane tread. 24”or 36” width, 24”or 36” length, 533/8”overall height. Mobile Workstations allow for easy relocation of stations as needed. Further, each workstation features four 5” poly stem casters (two with brake). Additionally, overshelves are height adjustable in 1”increments for flexible and accurate placement without the use of tools. 24” width, and available in 36” or 48” length. Available in stainless or chrome finish. Optional keyboard drawer available. 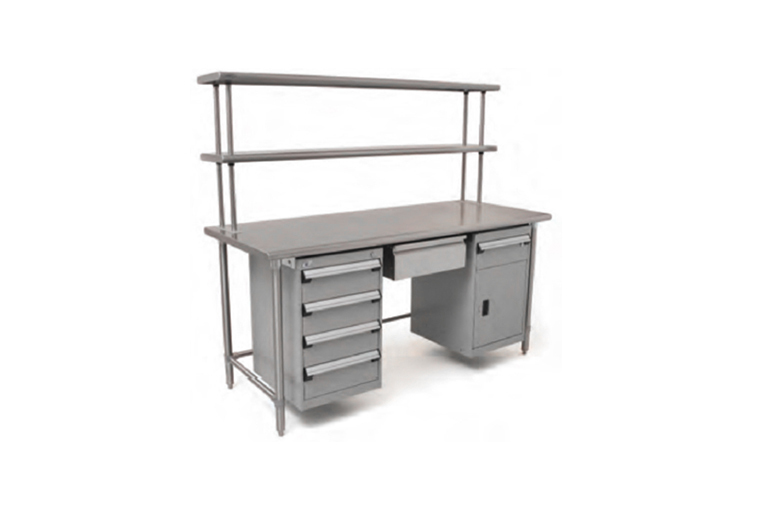 Spec-master workstations feature a 14 or 16 gauge stainless steel top. 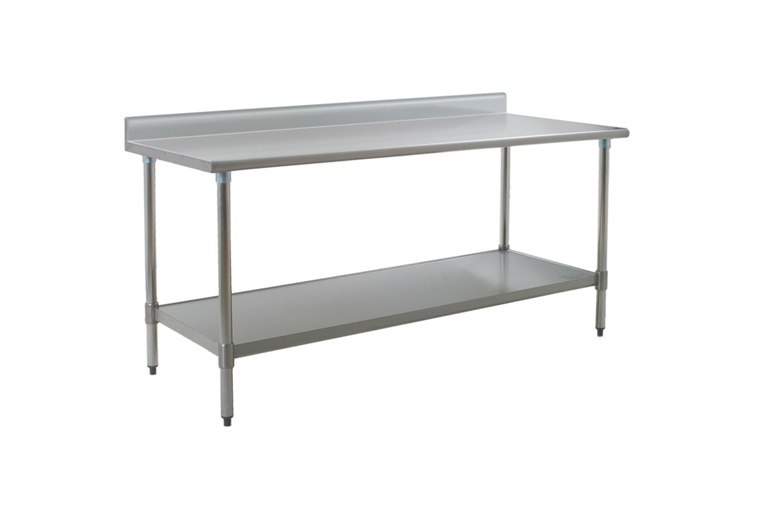 Moreover, all workstations are available with an adjustable stainless steel undershelf or tubular base. Each workstation provides a flat surface by flipping left and right ends down 90°. Likewise, sound deadening insulation tape runs between hat channel and table top. In addition, all workstations feature our patented uni-lok system which provides greater strength and a bullnose edge on front and rear (without backsplash). Stationary Workstations feature open wire construction offer 62% laminar flow with up to 800 lb load-bearing capacity. 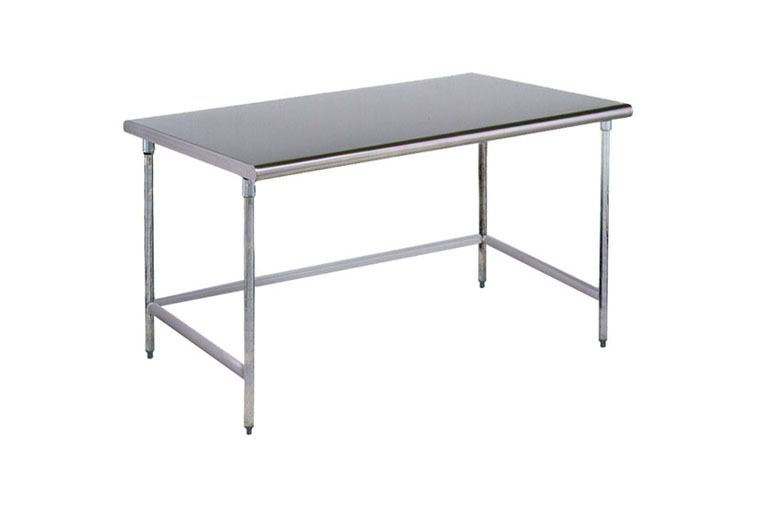 Likewise, each workstation includes electropolished stainless steel or chrome finish. 24”width, and available in 36”or 48”length. In addition, optional keyboard drawer is also available upon request. Height Adjustable Tables are perfect for all ergonomic applications. Tables adjust from 32” to 40” in height. Available in 24” and 30” widths, and lengths ranging from 48” to 72”. Further, stainless steel hat and leg channels reinforce the top of the table (with patented uni-lok channel gusset system). Traditional Hand Sinks are type 304 stainless steel all-welded construction deep-drawn, one-piece, seamless bowls. Further, models vary from the traditional hand sink with faucet to the electronic hand sink with soap and towel dispenser or hot water heater. Lastly, sinks are available in both wall mount and pedestal type models. FN Series or 314 Series Sinks are deep drawn sinks have a generous radius and are rectangular for maximum capacity. 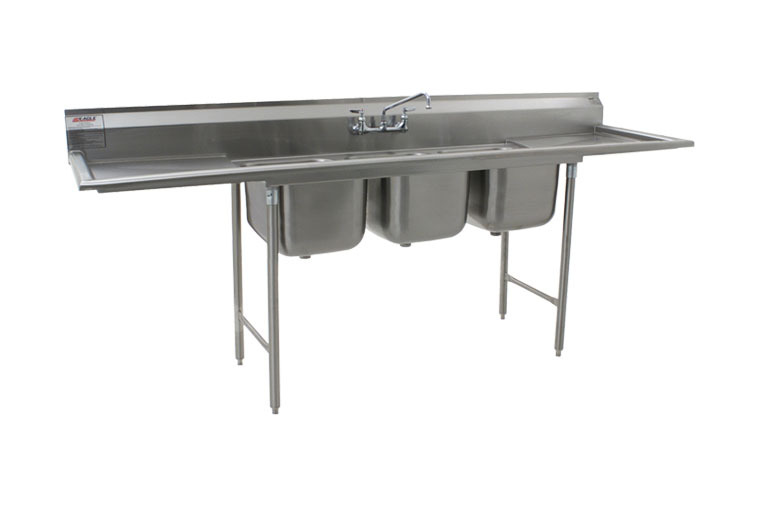 Moreover, our deep drawn sinks feature maximum stability and support with galvanized legs welded to adjacent to sink bowl. In Addition, sinks come standard in one, two, three, or four compartments with or without drainboards. Hand Sinks with Standard Towel Dispenser and/or Soap Dispenser offer deep-drawn positive drain and splash mount gooseneck faucets on all models. 304 series stainless steel comprises all sinks and towel dispenser. Soap dispenser on all models holds 16 ounces. Towel dispenser holds 4” X 10” (102 x 254cm) and C-fold disposable paper towels. The Touch-Free Handwashing System is constructed of type 304 stainless steel with deep-drawn positive drain sink bowl, basket drain, inverted “V” edge to prevent spillage, removable stainless steel trash container, and MICROGARD® antimicrobial protection. T&S electronic-eye faucet with hydrogenerator power source, hard roll paper towel dispenser, hands-free hand sanitizer dispenser, hands-free soap dispenser, glove rack and white bristle nail brush. 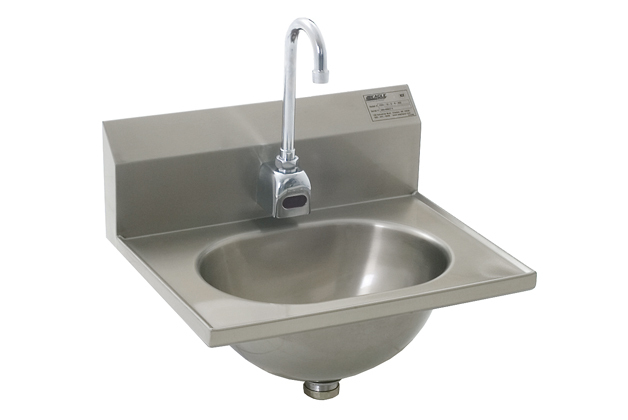 Other systems available feature hand sink with skirt only (no waste receptacle) or hand sink with end splashes. Electronic Eye Hand Sinks feature electronic “eye” sensor beam that activates water flow and adjusts from 3” to 12”. Requires 120-volt, 15-amp electricity plus 120-volt AC adapter. Further, our electronic eye hand sinks offer a splash mount gooseneck spout, lever or basket drain and Y-inlet non-adjustable mixing valve. The Microgard serves as an anti-microbial agent containing built-in protection to retard the growth of a broad range of bacteria. 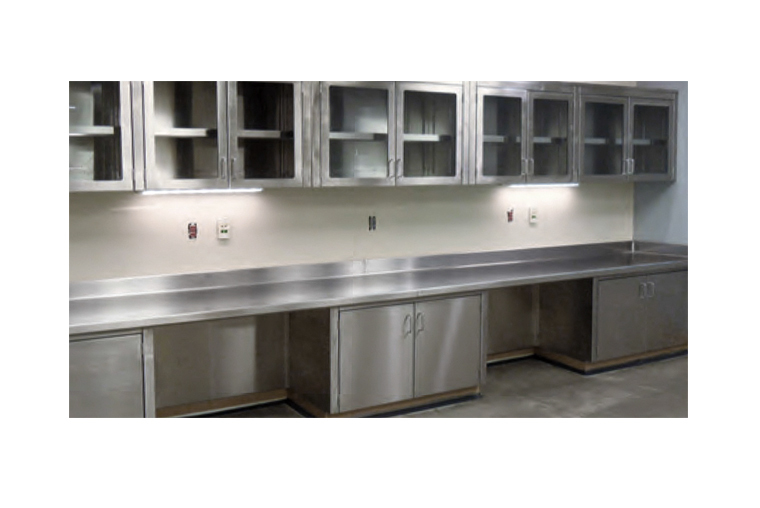 All Stainless Steel Countertops are 16 or 14 gauge, type 304 or 316 stainless steel. Further, all counters feature standard front edge Square or Box Marine, unless otherwise specified. Likewise, standard height of back and end splashes is 41⁄2˝, unless otherwise specified. Either a mechanical hairline seam or field welded joint available per your specifications. Maximum length without seam is 144˝. Each end splash requires a 51⁄2˝ length reduction. Moreover, complete field welding and finishing services are available at additional expense. Fabricated sink bowls available in most any size and depth with single or multiple compartments. Specify your requirements: Type 304 or 316 stainless steel, drain size and location, overflow hole if required. The splash for backsplash mounted faucets needs to be at least 2˝ deep for plumbing access. Both L-shaped and U-shaped tops are available per your drawings. Countertops have galvanized steel reinforcing hat channels. Additionally, our counters include factory installed sound deadening tape. Top support options include NSF listed sprayed latex sound deadening and marine grade plywood backing with white laminate facing. Further, we include standard wood reinforced cardboard packaging in the cost. Full crating available. All floor troughs include built-in pitch towards drain ensuring complete drainage. Further, anchor straps secure all troughs. Likewise, stainless steel drain accommodates up to a 4” diameter pipe, and removable perforated stainless steel basket. Lastly grating options include stainless steel subway-style or fiberglass. Anti-Splash Floor Troughs were designed to assure complete drainage while preventing splashing back onto the floor. Moreover, each trough features yellow fiberglass or Wide T-Bar Fiberglass grating. ADA-compliant. Wider T-bar width provides a more solid walking area, and prevents objects from falling through. Lastly, all troughs are resistant to corrosion, skid, fire, chipping and cracking. Cool Trough® Water Tempering Systems feature integral mechanical temperature sensor maintains water temperature of 130F or less. In addition, built-in pitch towards drain ensures complete drainage. 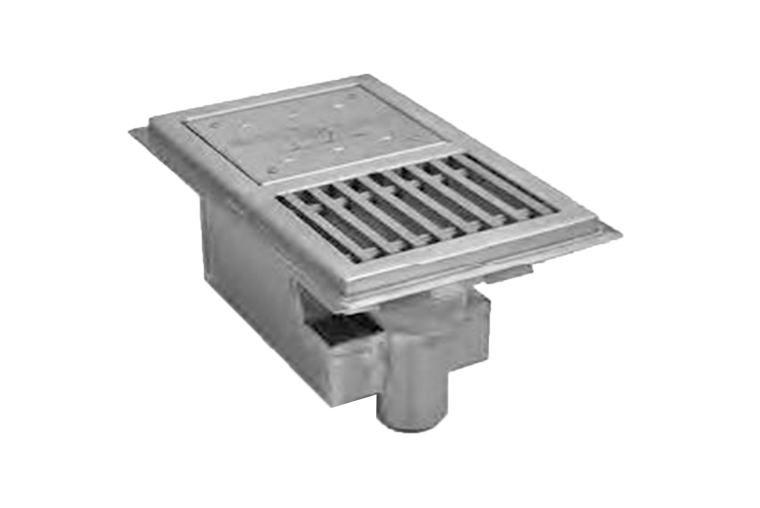 Moreover, each Cool Trough features gray fiberglass grating and no electrical connection requirements. Anti-Splash Cool Trough Water Tempering Systems feature a wide range of sizes. 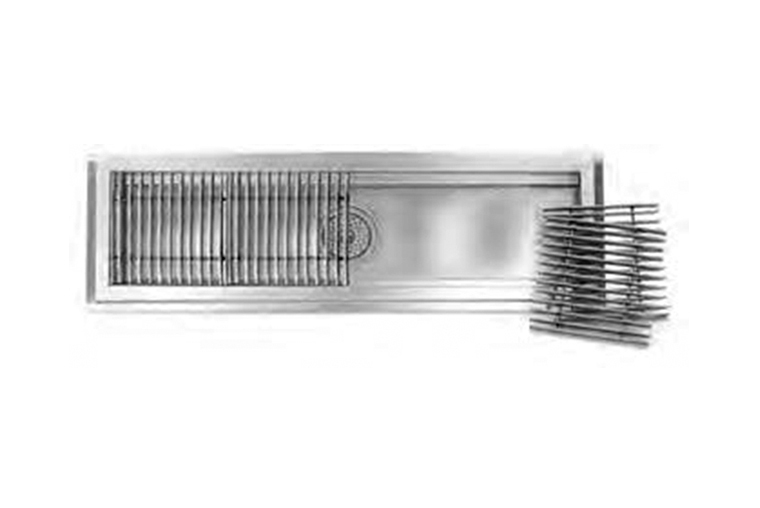 Both Fiberglass Grating and Subway-style stainless steel grating offer dimensions of 15” x 12” through 96” x 93”. Our shoe racks feature wire shelves offer the optimum combination of laminar flow and ventilation for the storage of cleanroom shoes. In addition, rods and tabs run through the shelves to create cubbies for each pair of shoes. Likewise, optional snap-on plastic label holders are available for identification of each storage unit. Our available finishes include both chrome and electropolished stainless steel. Further, our shoe racks include foot plates for fastening the unit to the floor. 14”width, ranging in lengths from 24” to 72”, and up to 86” in height. Roll Bag Dispensers Provide an effective means of dispensing rolls of bags or film. Further, our roll bag dispensers provide an easy way to establish protocol, by color cordinating cleanroom waste and thereby avoiding inadvertent mixing of non-compatible items. 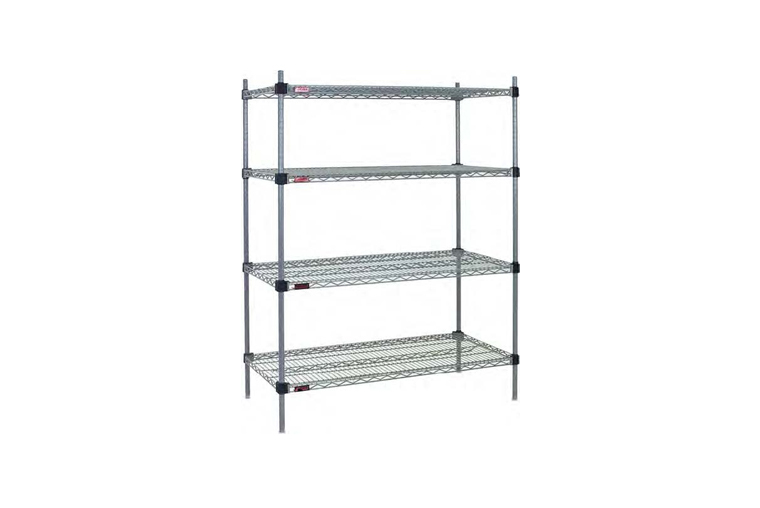 Standard unit consists of two 14” x 48” wire shelves, one 3-sided channel frame, eight removable dispensing bars and four 74” posts with 30” outrigger feet for stability. Dispensing bars are adjustable on 1” increments. Available in stainless steel or chrome finish. Unit measures 30” wide, 48” length, and 75” height. Lastly, custom sizes are also available.